Eager.one and eWorks have joined forces and developed a tool to test riggers for specific expertise by onboarding. 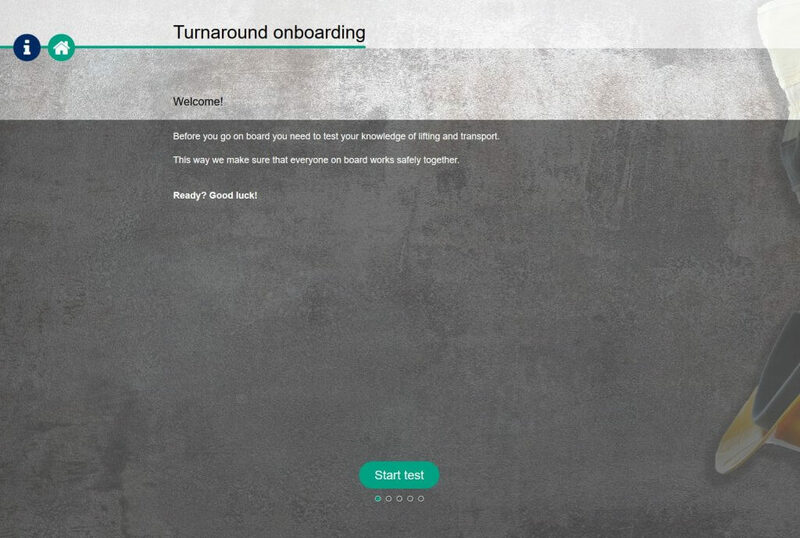 Eager.one and eWorks have developed a tool for Turn Arounds to test riggers individually for specific professional knowledge about lifting and rigging during an onboarding. In this way the Asset Owner has insight into who is entering the gate with the right papers, substantive knowledge and qualities to perform the job well. You need to go onboard? Test your knowledge by answering these questions you need to know. Hundreds of employees go onboard at a Turn Around without the right expertise. This tool tests your knowledge of lifting and transport. Ready to try our three question teaser? Good luck! Characteristic of a turnaround are the tight deadlines, strict planning and the urgency of safety. Many riggers come to the port to check in at the same time. Efficient work is a must! To check all employees for correct knowledge is almost a mission impossible. As a result: the risk of accidents was high. What is important? The passage at the gate must go smoothly, the contractors are aware of safety requirements and do have specific professional knowledge. Only employees with a certificate and a sticker on the helmet, who have passed the test, may continue. This increases the efficiency of an onboarding and decrease the number of accidents. How does this onboarding tool work? Directly at the gate, quick, clear and controlled. After the test there is visible proof who is tested on what. In groups of 40 people, but testable per individual. Fast, focused and controllable!